Salesforce.com, a Facebook Marketing Partner, tapped into Facebook Audience Network with its release of Salesforce Marketing Cloud Active Audiences. 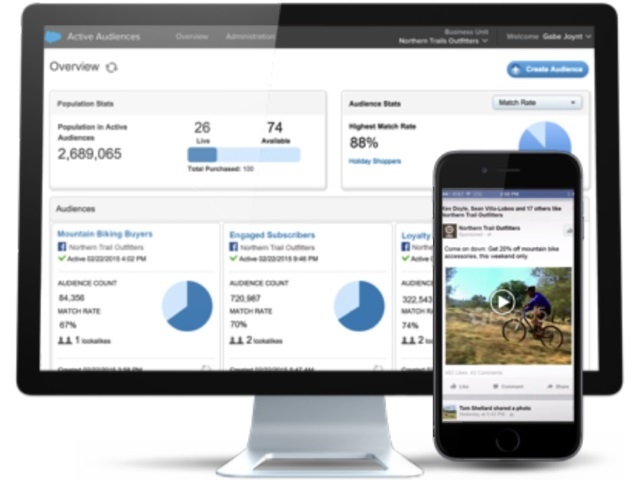 Active Audiences allows marketers to manage, segment and synchronize their customer-relationship management in real-time across Facebook, Twitter and mobile applications via Facebook Audience Network. Another component of Salesforce Marketing Cloud, Social.com, enables marketers to buy and optimize ads targeting real-time audiences, reaching those audiences based on events and triggers, such as online purchases, opened emails or upcoming travel. For example, a large hotel brand can use Active Audiences to support an ongoing campaign that delivers an ad to all guests who will stay at its San Francisco hotel in the next two weeks with local specials and promotions. The same brand can run a campaign to all guests who are key members of the hotel loyalty program but have not stayed with them in the previous two months. The future is people-based marketing, which is a shift from delivering advertising that reaches everyone to delivering ads to the people who are most relevant. New capabilities from Facebook Marketing Partners, like Salesforce.com’s Active Audiences product, allow marketers to connect with their customers in new ways by optimizing Facebook ad campaigns based on anonymized customer interactions. Today, advertising is reliant on tracking consumers and the devices they use. Mobile tracking has provided an added layer of insights into consumer behaviors, with makes mobile targeting and tracking all the more essential. Using Active Audiences, we are able to tap into our customers’ vast knowledge of their customers and create an actionable and scalable targeting model that delivers higher ROI (return on investment).